Judges Choice Winner Richard Risby, joined by his wife Patty, along with Charley Risby and Jill MacDonald. People’s Choice Winner The Fantastic Superstars Choreographed and lead by Debbie Kielmar. Pictured left to right: Autumn Dowdy (who has been part Dancing With Our Stars all 7 years), Toni Dengel, Martin Miranda, Jeremy Slusher, Debbie Kielmar. Front row Alannah Miller, Dianne Coriell-Rice (Also been part Dancing With Our Stars all 7 years),and Rachel Perry. 2019 Mirror Ball Winner Kevin Hoops who raised over $31,000 this year. His combined funds raised for the Red Cross over the past 3 years exceeds $100,000. Presenting the award was Debbie Smith Red Cross Community Executive (right) Kevin Hoops and (left) Dr. Steven Rader Ohio River Valley Board Chair. The 2019 Cast of Dancing with the Stars. 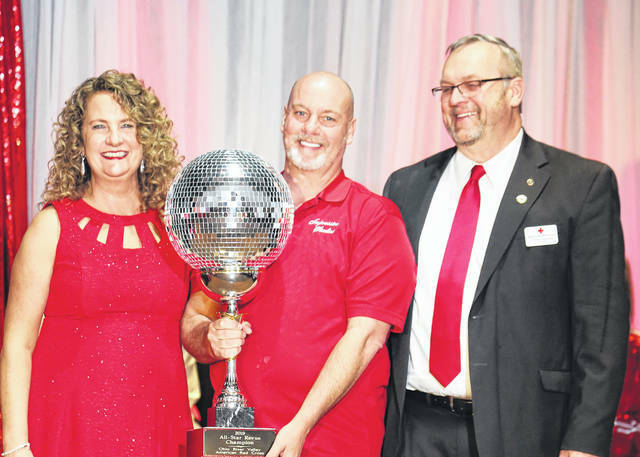 Some disappointment may prevail, following the 7th and yet last season for the Red Cross’ Annual Dancing With the Stars, which took place on Saturday evening. This is an event that many look forward to each year, but with the passing of time, this too must end. 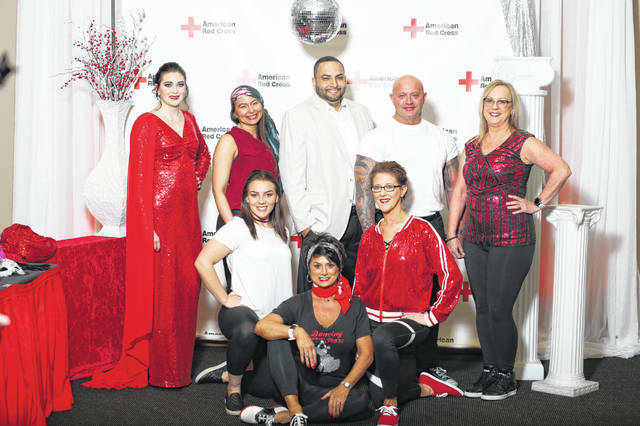 The Local Red Cross will be creating something new for next year and who knows, it may be even more fun than the DWTS has been these past seven years. This year’s DWTS once again, proved successful and all seemed to enjoy the event at the SOMC Friends Center. The event was able to raise over $98,000 for the local Red Cross to help those affected by home fires and other disasters. This year’s Mirror Ball winner was, Kevin Hoops, who raised over $31,000. And not to be forgotten, his combined funds raised for the Red Cross over the past 3 years exceeds $100,000. 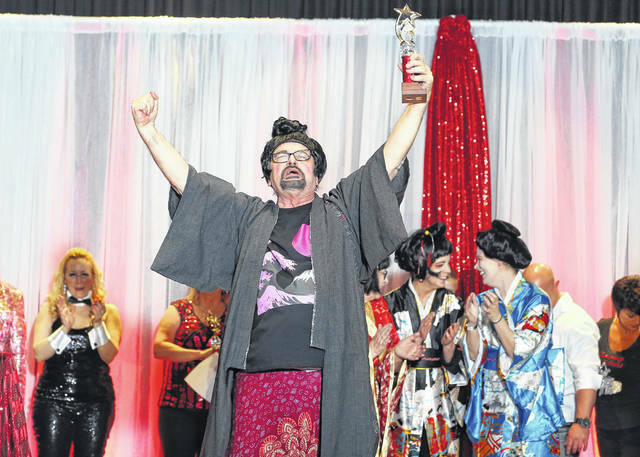 The People’s Choice winner was, The Fantastic Superstars who were choreographed and lead by Debbie Kielmar. The group consisted of Autumn Dowdy (who has been part Dancing With Our Stars all 7 years), Toni Dengel, Martin Miranda, Jeremy Slusher, Alannah Miller, Dianne Coriell-Rice (Also been part Dancing With Our Stars all 7 years), Rachel Perry and Debbie Kielmar. And, one of the favorite category winners, was the Judges Choice Winner, Richard Risby. “Saturday marked the 7th and final season for Dancing With Our Stars-All Star Revue. 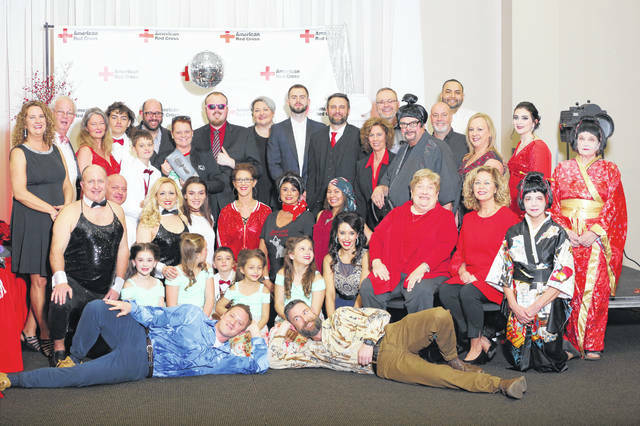 As the Community Executive for The Ohio River Valley American Red Cross, I could not be more proud of our community and all that our Red Cross has accomplished,” said Debbie Smith, representing the local Red Cross. “Thanks to the generous support we raised over $98,000. This helps our local Red Cross to be able to help your neighbors as we prevent, prepare for and respond to emergencies. “Last year your local Red Cross with the support of many awesome volunteers, collected 4,498 units of blood, trained 1,294 individuals in life saving skills, delivered 205 messages to active local service members, provided aid to 511 individuals who fell victim to single family fires and other disasters, and installed 1,517 FREE smoke alarms in local homes, and saved 3 lives in South Webster due to previously installed smoke detectors,” Smith said. All of this could not be possible without the events that the local Red Cross does, just like Saturday’s event. Keep looking forward to what the Red Cross has in mind for next year’s event. It is bound to be something as good as DWTS or even better.